An earthquake swarm with several tens of M5+ class events shook offshore eastern Taiwan in early February significantly from 4 February 2018. Couple days after the swarm, an ML6.26 (preliminary determined local magnitude of ML6.0, and MW 6.4) earthquake struck eastern Taiwan on 6 February 2018 at 11.50 pm (local time). 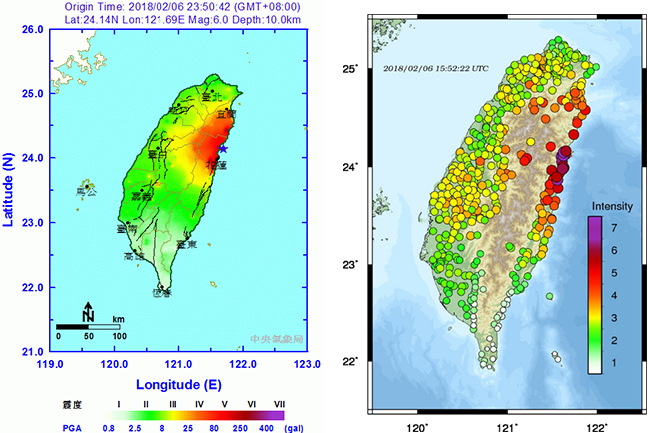 According to Taiwan's Central Weather Bureau (CWB), the ML6.26 earthquake had originated offshore approximately 15 km north of Hualien city at a depth of about 10 km, and ruptured toward southwestern with a surface rupture near the city Hualien, which resulting in, unfortunately, several severe damages to tall buildings, and caused 17 deaths and 289 injuries. The earlier earthquake swarm took place on an offshore thrust fault system near the western edge of the subduction slab. In comparison, the 6 February MW 6.4 earthquake might be originated from the eastern offshore subduction zone system, but, triggered a strike-slip fault system along the Milun fault system that rupture across the Hualien city. Fig. 1 shows the seismicity and temporal revolution of the earthquake swarm of 4 February and the ML6.26 earthquake sequence of 6 February. Spatial and temporal distributions of the swarm of 4 February 2018 and the ML6.26 earthquake sequence of 6 February 2018. 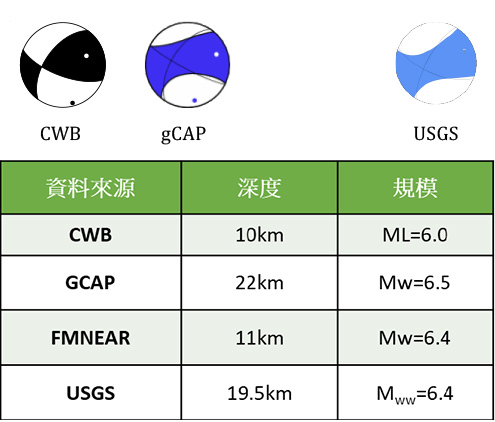 The CMT focal mechanism from CWB and gCap of BATS (Broadband Array in Taiwan for Seismology) demonstrated that this 6 February event was mainly a strike-slip focal mechanism with minor thrust component (Fig. 2). Focal mechanism derived from different agencies. FMNEAR represents the historical event near the current event. The intensity of this event (Fig. 3) from CWB strong motion network, and the P-alert system (an earthquake early warning system operated by National Taiwan University) show that this earthquake stuck inland eastern Taiwan with intensity of level 7, which yielding the peak ground acceleration (PGA) of > 400gal. The strong motion stations nearby recorded pulse-like velocity motion of peak ground velocity (PGV) of > 100cm/sec with period of about 1 sec. This pulse-like velocity motion might be responsible for the extensive damages in Hualien city. 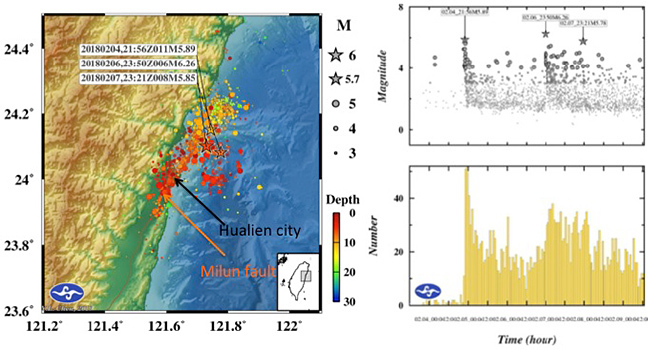 Preliminary study from seismic waveform analysis and GPS data (Taiwan Earthquake Research Center, TEC) suggest that a large slip region near the surface (asperity) occurred right beneath the Hualian city along the Milun fault. 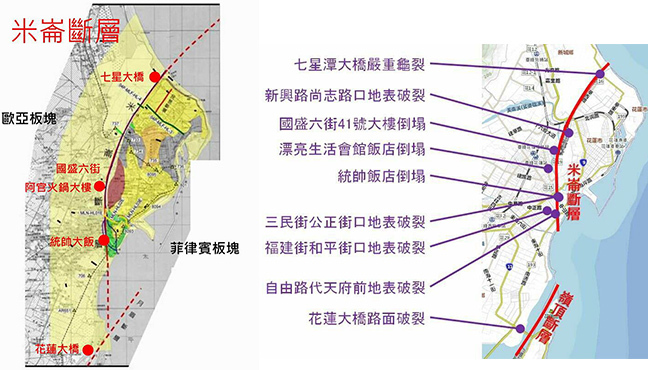 Intensity map of 6 February 2016 Hualien earthquake from CWB strong motion network (left), and the P-alert system (right), an earthquake early warning system operated by National Taiwan University. Several groups of scientists investigated the surface rupture of this event immediately right after the earthquake. Reported surface ruptures were found mainly along the Milun fault as shown in Fig. 4 and Fig. 5. The damaging tall buildings mostly located to the southern section of Milun fault, close to the strong motion stations with recorded pulse-like high PGV. Preliminary inspection of the collapsing tall buildings, in addition to the locations within 200m to the Milun fault and close to the observed large PGA and pulse-like PGV, these tall buildings were mainly with weak 1-2 floors for the redesigned of the building structure for commercial usages. . Most of the damaging tall building was built more than 30 years ago before the new enforced building codes after 1999 Chi-Chi earthquake. Much attention was now made by government to enforce the regulations on the inspection and retrofit of old tall buildings. Reported significant damaging buildings and surface rupture documented by Dr. M.-L. Lee (NTU). 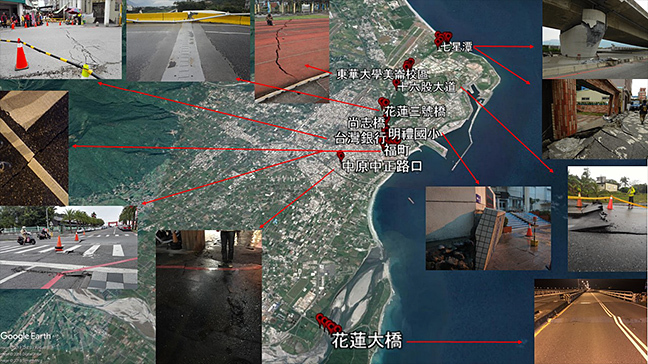 Photos with reported surface rupture documented by E-TEC group of Dong-Hua University. According to the seismogenic structure delineated by Shuy et al. (2016) from seismic tomography and seismicity, the 4 February earthquake swarm and 6 February ML6.26 earthquake sequence were from the western edge of the collision boundary of the subduction slab to the island of Taiwan as shown in Fig. 6. ML denoted in Fig. 6 is the Milun fault. Tectonic structure of eastern offshore Taiwan by Shyu et la. (2016). Historical events in this region had been studied and characterized by the features with earthquake swarms (Fig. 7). The significant historical damaging earthquakes were 22 October 1951, which had three M7+ class earthquakes within 12 hours. Several surface rupture patterns of this 6 February 2018 event were found to be similar to those of the 22 October 1951 events along the Milun fault. Historical damaging events distribution in eastern Taiwan since 1900. Taiwan Earthquake Model (TEM, sponsored by Ministry of Science and Technology) published a National Seismic Hazard Map in Dec. 2015 with the earthquake occurrence probability of identified 38 inland seismogenic structures of the next 50 years (Wang et al., 2016). Fig. 8 shows the Milun fault (labeled #32) exhibits one of the highest seismic potential with probability of MW6.4 of about 42% in next 50 years. In the study of TEM (Wang et al., 2016), from the compilation of the geological data inland, the Milun fault has the fastest recurrence interval as about 70 years among all inland seismogenic structures. Unfortunately, this high seismic hazard potential did not receive enough attention, which resulted in such unfortunate casualties. 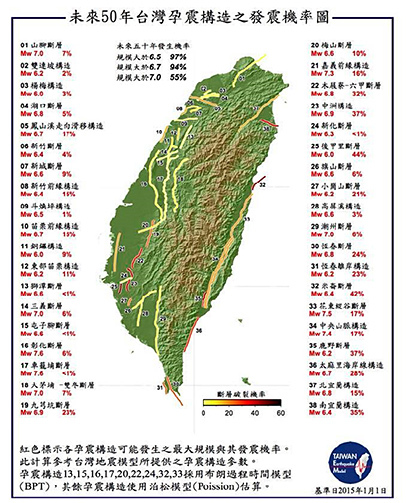 Earthquake probability map for 38 inland seismogenic structures published by Taiwan Earthquake Model (TEM) of the next 50 years. Milun fault was labeled as #32. The 4 February 2018 earthquake swarm and 6 February 2018 Hualien ML6.26 earthquake sequence occurred in fault system associated with subduction slab offshore eastern Taiwan. The 6 February 2018 Hualien ML6.26 earthqake initiated close the earlier earthquake swarm but with a rupture southwestern toward inland along the identified Milun fault in Hualien city. 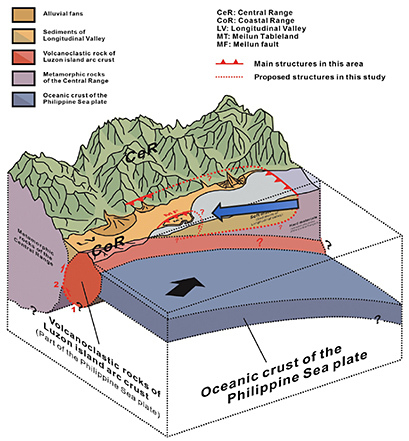 The complex tectonic structure as in the boundary of the western edge of the Phillipine Sea Plate with subduction and collision made the difficulty in identification of the seismogenic fault structure. 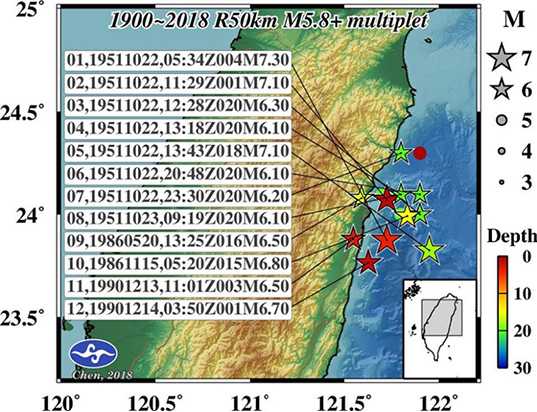 Historical earthquakes in this region characterized by earthquake swarm with significant damaging earthquake sequence with three M>7 events within 12 hours in 1951. The high earthquake probability of Milun fault exhibited by the seismic hazard map reported by TEM suggests the special attention is needed to those high seismic potential seismogenic structures. The possible similar rupture patterns observed in 6 Feb. 2018 Hualien earthquake and 22 Oct. 1951 along the Milun fault, and the high PGA with large pulse-like velocity motion suggest the need to the regulation of the near-fault building codes and the understanding of the generation of large pulse-like velocity motion in seismology. Shyu, J. B. H. , C. F. Chen, Y. M. Wu (2016), Seismotectonic characteristics of the northernmost Longitudinal Valley,eastern Taiwan: Structural development of a vanishing suture, Tectonophysics (2016), http://dx.doi.org/10.1016/j.tecto.2015.12.026. This article is written mainly with the reference from the report of 6 February 2018 Hualiean earthquake sequence of Taiwan Earthquake Research Center (TEC).